The story of Marc Cornelisen and his colleague, Philip DeRoo, is by turns comic and tragic, an epic that is nearly twenty years in the making. Cornelisen had been traveling out to the North Pole nearly every year since 1996, braving the extreme temperatures and seasons as an explorer and scientific researcher. He experienced firsthand many of the drastic changes in temperatures reported by scientists throughout the years, investigating climate change to give further depth to his life-long career as an explorer. A number of measurements he recorded and reported back himself, in an attempt to understand the rapid decline of ice – something that was likely contributed to his untimely death at the age of 46. DeRoo is also presumed dead, shortly after his 30th birthday, which took place during their Arctic adventure. Their final mission was a region of North America, known ominously as “The Last Ice,” the last chance at solid ground before entering the foreboding Arctic Sea, and perhaps one of the regions of the world that’s the most unchanged since the end of the last Ice Age. Cornellisen died with his boots on, both literally and figuratively, on April 29, doing what he loved the best. It was the idea of the primitive man vs. nature conflict that first attracted him to the region, shortly after finishing school with a degree in architecture. He thought it would be his last chance at an epic adventure, before having to settle down with a boring 9 to 5 desk job – it was meant to be a one time visit to the magnetic North Pole, where he first arrived with his mountain bike, a move that brought him derision from the local Inuits: “Why don’t you bring a phone booth? It’s going to be as much use as a mountain bike,” one of them laughed at Cornelissen. The former’s prediction was proven right. The mountain bike, despite being designed specially for the voyage, sank into the snow by its wheels. Determined, Cornellisen quickly switched over to skis. The first trip emphasized to him the virtue of staying patient while traveling in extreme environments. This was the first in his life that he had encountered young sea ice, known locally as nilas. Nilas is only several centimeters thick and while it is durable enough for walking on, it is not stable enough for a person to stand on. When someone skies across a sheet of very thin nilas, the ice vibrates in a wave, not too different from an echo. Veteran Arctic travelers know not to stop when they feel this. Instead, they pick up their in order to stay ahead of any shattering ice. In another five years, Cornelissen had been to both the North and South poles of the world and had traversed across nilas thousands of times over the Arctic Ocean. He began to experience firsthand the impacts caused by man-made climate change at higher latitudes in which the sea ice is declining rapidly due to rising temperatures and greenhouse gases. The average thickness of sheets of sea ice back in 2012 was only about 1.25 meters, which is a considerable drop from the 3.59 meters recorded back in 1975, according to the newest studies. One particularly unusual episode transpired back in 2005, when Cornelissen sat on an outdoor toilet and looked up, into the eyes of a polar bear who ventured too close to the encampment. With his heart pounding, his initial resolve was to surrender, as he recollected later during an interview with a Dutch adventure magazine. He then thought of his daughter back at home in the Netherlands and quickly gathered up some new found strength. He picked up a nearby shovel and began shaking it in the bear’s face, as the animal had already begun standing up on its hind legs, prepared to size up its prey. Cornelissen shouted, and one of his colleagues immediately leapt from the tent with a rifle, running to his rescue. While the bear was so close to Cornelissen that shooting it was out of the question, a warning shot was ample enough for the two men to scare it off. Cornelissen quickly became interested in the climate problem, particularly as this land so close to his heart was at risk. Determined to find what he could do to help, he quickly discovered that the most productive way for him to contribute was through working with scientists and taking measurements throughout his own expeditions. Thus for over a decade, he forged a collaboration working with the European Space Agency’s Cryosat program. Scientists have done measurements of sea’s ice thickness in the Arctic for a number of years, but the reliability of this data often varies, and it’s been even more difficult to obtain by satellite. Even the older measurements taken have been somewhat haphazard in matters of space and time. Placing a scope into what is a continuously shifting, moving mass of ice at one fixed location really doesn’t tell us much about the entire Arctic Sea as a whole – much less how uniform the process of decline in thickness is with latitude. In order to compensate for the lack of any comprehensive measurements, ESA designed and launched the Cryosat-2 satellite back in 2010, the first satellite for measuring ice thickness along the poles. The measurements taken by the satellite needed to be ground-truthed. Cornelissen continued to make his routine trips to the Arctic, where he measured the ice thickness and snow depth, invaluable data for the ESA to calibrate its satellite findings. When he was back home in Europe, he began an effort to educate people about the dangers of climate change and the implications it had on the future. Between the years 2005 and 2007, he took with him a group of young Europeans to the Arctic, towards the top of the world where they would have first-rate views of the changes that were rapidly occurring. Most of his former students were inspired and to this day remain as avid communicators on the current shape of the environment, according to Cara Augustenborg, who went with Cornelissen on an expedition back in 2007. Augustenborg herself currently serves as a spokeswoman on climate change for the Green Party of Ireland. “He might be this relatively unknown figure in the world, but when you look at his impact, it is actually enormous,” she said. During one memorable trip, Cornelissen got in touch with George Divoky, an ornithologist and researcher with the University of Alaska, Fairbanks, who spent the last 37 years at the remote Cooper Island where he dedicated his study to the migration of local seabirds. The two quickly recognized a kindred spirit, as they both regularly returned to the Arctic year after year out of a strong desire, leaving the comforts of home, a wife and children behind them to brave the wilderness. “Even though there is a personal life and also all the comforts when you aren’t in the Arctic, there is this compulsion to go back,” Divoky said. In April of this year, the wanderlust brought Cornelissen and de Roo to Resolute Bay, the northernmost point in Canada, and miles away from any human settlements. It was from here that they undertook a further expedition for mapping the sea ice thickness, the beginning of “The Last Ice” expedition. According to scientists, the Last Ice Area may perhaps be the most resilient when it comes to global warming. 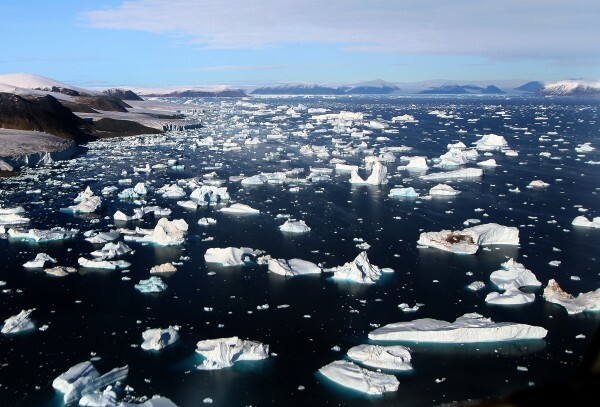 Sea ice there during the summer months will continue to hold out for decades, despite the rest of the Arctic sea ice melting away, a disastrous scenario that may commence as early as the year 2040. The Last Ice Area encompasses about 500,000 square miles in and around Canada. So pristine is this northernmost point that the World Wildlife Foundation and ColdFacts, Cornelissen’s company, have suggested the region should be declared a special management area. Concrete scientific data regarding the ice conditions are required for establishing a reserve revolving around the idea of the most resilient glacial ice, something that the two friends hoped to provide soon. On April 6, Cornelissen and de Roo took off on their skis, the first day they would attempt to map ice conditions across a route stretching 249 miles northward from Resolute Bay. They had planned to share their data with local researcher Christian Haas, a scientist from the University of York in Canada. Haas failed to respond to ClimateWire’s request for a comment. Cornelissen and de Roo waited out their first few days making little progress while training the watchdog the brought along named Kimnik, who kept spirits up throughout the trip with her inexhaustible store of energy and playfulness. Kimnik had been specially deputized to guard against polar bears after Marc’s 2005 encounter. While she was a large dog, she was described by Cornelissen as being playful like a puppy in a voice dispatch. She was not interested in pulling her own sled, so de Roo and Cornelissen were forced to lug 30 to 50 kilograms of dog food each during the trip’s first few days. It was relentlessly cold and windy as they continued the hike north, “but that’s part of the deal, no complaining on this end,” Cornelissen said. When the evening shades drew on, they set up their camp and enjoyed an evening supper of rice, shrimp, chili and sometimes they would have an even more elaborate meal whipped up by “Chef Marc” Cornelissen — from raw materials found in the wilderness, along with a cup of coffee. Either Cornelissen or de Roo would then use their satellite phone for relaying voice messages back home to discuss their day before quitting for the night. April 10 proved to be eventful. When the men took their routine scientific measurements, Kimnik mustered her brute strength in order to break free from her leash and with great excitement, bounded over to her two companions. She was by now very attached to her new owners. When the team skied that afternoon, clouds drifted overhead. The sun finally slid through, casting a calm light that revealed a pristine landscape. The next day, as though the magical wintertime atmosphere had an effect on her too, Kimnik started carrying her own sled. Later that evening, Cornelissen instructed de Roo to stay in his sleeping bag until 8 o’clock in the morning. When de Roo finally crawled out, he found the tent decorated, a birthday cake, greeting cards and even small presents lying about. It was officially de Roo’s 30th birthday. “I can’t believe that he took that [weight] the whole way and the first part of the expedition with him,” de Roo said. “It is really, really special to be over here and celebrate [the birthday] over here on the ice with Marc [Cornelissen].” Their camaraderie was a weathered constant, contrasted with the ever mounting challenges from both the weather and terrain. Throughout the course of their next week, the two men confronted changing winds and temperatures that dropped as low as minus 40 degrees Celsius. The terrain now transformed into a mixture of flat ice, rubble and large areas of open water known as polynyas. By April 19, Cornelissen and de Roo had covered 125 miles of terrain. They spoke to Haas, the scientist from York University responsible for their project, and it was then that they “decided to make their route a bit more interesting and challenging,” according to Cornelissen. They decided they would travel northeast instead of going straight north. This path would bring them into contact with more rubble as well as multi-year ice. Within several days, the terrain turned to slush, almost an icy quicksand, where they risked sinking in when they traveled on foot. They decided to measure the thickness of ice below the slush, where they discovered “surprisingly thin ice, about 80 centimeters,” in thickness, Cornelissen recorded on April 24. Along the horizon, the men saw gray smoke climbing into the air, a sort of relief when traveling in the Arctic which announces you’re near a source of open water. On April 26, the explorers skied past tracks of polar bears — likely a family, with tracks from big males as well as females guiding their cubs. April 28 surprised them with some unseasonably warm weather. “It was a strange day,” Cornelissen recalled later that night. The temperatures actually reached a high of zero Celsius, typical winter weather for the American East Coast. It was so warm that day that the explorers were unable to ski with their polar outfits, so they stripped down to their long underwear. “It is very good that you guys don’t have picture of this from the ice,” he laughed. The next day, the Resolute Bay Royal Canadian Mounted Police got a distress call sent by the two men. An aircraft circled over the area, discovering their two sleds, alongside open water and poor ice conditions – not a good sign. One sled and several personal items were found in the water. Nearby, was a second sled that had been partially unpacked. Kimnick stood guard over the site. The explorers had vanished – nowhere to be found. The RCMP determined that the men had drowned and put a halt to their search. “Evidently, one of them had broken through the ice, and it would seem the other one has gone to help him and suffered the same fate of falling through,” according to Mark Drinkwater, an ESA mission scientist and a longtime collaborator of Cornelissen’s. That the region was full of thin ice was apparent, particularly with such warm conditions. Why remains a mystery. It could have been that due to strong ocean currents, the ice had been thinned, continuously hit from below by bursts of warm water, or directly from the wind, which is strong enough to sometimes generate open water areas. We may never know the answer for sure. Climate change could have had a part to play, but not necessarily. One thing is clear, however. The Arctic is warming at a much faster rate than anywhere else on the planet, but it is difficult to truly say what the impact due to warming ice throughout the region is when it comes to thickness, relying on a number of factors that can make it dangerously unpredictable, according to Drinkwater. “Who is to know if that’s the underlying reason why the ice was so unpredictably thin or dangerous at that time of year?” he said. These men were far thrill seekers, which their friends all attested to. They were seasoned adventurers uncovering new knowledge in the name of science, who would have avoided the ice had they been aware of its instability. Kimnick has since been found and rescued, but persistent bad weather has stalled efforts to retrieve the men’s bodies Due to blizzard, helicopters are stranded from leaving Resolute Bay. Because of the fragile ice, however, landing is also a dangerous task. Friends hope that, while they may never have the opportunity to say goodbye to these brave men, their tragedy will at least make people more conscientious of the massive changes taking place throughout the Arctic.